Scientists and crew aboard CSIRO’s (Commonwealth Scientific and Industrial Research Organisation) Marine National Facility research vessel Investigator observed a plume rising from McDonald Island (the largest island) during the last week of January. Visual observations of the McDonald Islands are very rare due to its remote location. The following report comes from Matt Patrick of the HIGP Thermal Alerts Team. Two night-time ASTER images (Band 10, 8.3 microns, at 90 m pixel size) of McDonald Island show activity centered on the NW shore of the island. The December 2002 image was examined some months ago, but it was not determined whether the long-wave infrared (IR) anomaly was genuine, since it was relatively low intensity and there was no anomaly in the shortwave IR. The most recent ASTER image (12 July 2005) shows a somewhat larger long-wave IR anomaly, but more importantly, there are five pixels in the shortwave IR (Band 9, 2.4 microns; not shown) which are saturated, indicating this is a significantly hot target. Based upon McDonald's typical activity, the anomaly probably reflects low-level effusive activity. The first and only MODVOLC alert pixel showed up in November 2004 (BGVN 29:12). These ASTER images show that recent activity is centered around the NW flank of the island, very close to shore. Comparing the July 2005 image with the December 2002 image, there might be an indication of the shoreline growing westward, but it is hard to tell for sure with this resolution (90 meters). The location of this activity is generally consistent with recent BGVN reports: in 1999 steaming was observed on the N-NE part of the island (BGVN 24:01), and a recent Landsat ETM image indicated that island construction over the last two decades has expanded the northern portion of the volcano (BGVN 26:02 and 27:12). Andrew Tupper noted that he found the hot spot identification plausible. The question of edifice collapse and possible tsunami generation associated with McDonald Islands has recently been a subject of interest but little technical information is available on topics such as edifice morphology and slope stability. Information Contacts: Matt Patrick, HIGP Thermal Alerts Team, Hawai'i Institute of Geophysics and Planetology (HIGP) / School of Ocean and Earth Science and Technology (SOEST), University of Hawai'i, 2525 Correa Road, Honolulu, HI 96822, USA (URL: http://modis.higp.hawaii.edu/); Andrew Tupper, Darwin Volcanic Ash Advisory Centre (VAAC), Commonwealth Bureau of Meteorology, Northern Territory Regional Office, PO Box 40050, Casuarina, NT 0811, Australia (URL: http://www.bom.gov.au/info/vaac/). The Darwin VAAC issued a precautionary advisory on 10 August warning pilots of the possible presence of low-level ash near McDonald Island. The advisory was based on a press release made by the Australian Minister for the Environment and Heritage, the parent agent of the Australian Antarctic Division. The press release discussed a hotspot at McDonald Island that was visible on satellite imagery on 12 July. The Darwin VAAC did not see ash in satellite imagery. On 5 January, a pilot on an Antarctic sightseeing tour near Heard Island saw what appeared to be a volcanic plume. Information Contacts: Andrew Tupper, Darwin RFC/RSMC/VAAC, Bureau of Meteorology, Northern Territory, Australia. This report discusses field and geochemical observations that indicates activity at McDonald Island. The activity is inferred to have began in December 1996; it continued through early 1997. Visual observations. During mid-December 1996, a pilot reported a vapor plume in the vicinity of Heard Island (figure 1). Initially, the report was thought to indicate an eruption of Big Ben, an intermittently active volcano on Heard Island that last erupted in 1993 (BGVN 17:12). Another report discussed a possible volcanic plume near Heard Island on 5 January 1997 (BGVN 22:01). A 15 January 1997 satellite image showed an extensive high-altitude linear cloud formation drifting E from near Heard Island; this activity was also assumed to be associated with Big Ben. Figure 1. Location of Heard and McDonald Islands on the Kerguelen Plateau in the S Indian Ocean. "SWIR" refers to the Southwest Indian Ridge, "SEIR" to the Southeast Indian Ridge. Gaussberg is an isolated conical mountain of volcanic origin on the coast of Antarctica. Courtesy of K. Collerson. On 18 March 1997, the "RSV Aurora Australis," a ship en route to Heard Island, sailed within 7.4 km of McDonald Island. Observers on board reported seeing steam plumes emitted at high velocity from several point sources and from the fissure system on the island's steep N face between the topographic features known as The Needle, Samarang Hill, and Macaroni Hill (figure 2). They also saw a low, diffuse, white vapor plume extending SE from the island's N summit. Steam vented from a rubble-covered slope that possibly indicated a lava flow or pyroclastic deposit. Ken Collerson documented these observations on video tape (Collerson, 1997; Collerson and others, 1998). Figure 2. Sketch map of McDonald Island showing the new lavas in the vicinity of Samarang Hill. Courtesy of K. Collerson. On 2 April, observers on the vessel "FV Austral Leader" saw vapor rising from the island's summit. The ship came within 2.6-4.6 km of McDonald Island for closer observation and confirmed steam venting similar to that observed on 18 March. Observations included "smoke" clouds rising from the summit and flanks of the N and middle parts of the island, possible lava flows traveling down gullies, and a yellow- green deposit (possibly sulfur) close to the source of the steam emissions. In addition, a diffuse white vapor plume from the N summit of the island was drifting N to NE. An early April photograph of steam venting appears on figure 3. Figure 3. Photo of McDonald Island taken early April 1997 portraying steam venting at Samarang Hill (in the foreground). In the background resides glacier-draped Heard Island (44 km E of McDonald Island, with a summit elevation of 2,750 m). Copyrighted photo taken by Richard Williams and used with permission of the Australian Antarctic Division. Although observers never went ashore on McDonald Island during or after the eruption, Collerson estimated the extent of the lavas and fumarolic activity from visual observations, digital video images, and 35 mm photographs. A preliminary sketch map of new lavas appears on figure 2. On Heard Island, Big Ben's summit was usually obscured by clouds. The summit was visible on 20 March, however, and at this time no evidence of recent volcanic activity was observed at Mawson Peak, Big Ben's recently active crater (figure 4). Similarly no plume was seen coming from Heard when McDonald vented steam in early April (figure 3). In accord with these observations, scientists inferred that the December 1996-January 1997 volcanic activity attributed to Heard actually denoted activity at McDonald. Figure 4. Map of Heard Island showing principal volcanic centers on both the Laurens and Azorella Peninsulas (see shaded boxes) and on Big Ben (the massif comprising the bulk of the SE part of the island). The beached pumice samples were collected at the N end of the Laurens Peninsula. Courtesy of K. Collerson. Satellite observations. Satellite images showing plumes similar to volcanic ash clouds extending E from the Heard Island area were reported to Australia's Bureau of Meteorology during the summers of 1996-97. Standard detection techniques did not confirm that the clouds were volcanic; however, several volcanologists and meteorologists studied the plumes and concluded that the clouds were probably not volcanic. Meteorologists from the Tasmanian and Antarctic office of the Bureau of Meteorology suggested that the plumes were probably banner clouds, a type of cloud that often forms behind mountain peaks at high latitudes. The ~600-km-long plumes seen repeatedly on the satellite images were not consistent with the prior activity of Heard Island; Heard Island was unlikely to produce large-scale eruptions and high-level ash clouds. However, McDonald Island was not ruled out as a possible source of volcanic plumes. Geochemical studies. Researchers conducted major element and inductively coupled plasma mass spectrometer trace element analyses on the fresh pumice collected from Heard Island. The pumices were strongly alkaline with elevated incompatible element abundances. Although the results were similar to previous studies of McDonald Island phonolites, the pumices were generally more evolved, suggesting that they were derived from an extremely fractionated magma chamber. This conclusion was also supported by high- precision Th isotopic data. Extreme Na2O values for two samples, coupled with very high volatile contents and carbonatite-like HFSE and LILE abundances, suggested that some of the pumices contained an exsolved sodium- rich carbonate phase. Sr, Nd, and Pb isotopic compositions of six samples of the fresh pumice collected on Heard Island were within the error of values reported for McDonald Island phonolites. The Sr, Nd, and Pb isotopic data for the pumices differed from other potential young volcanic sources in the southern hemisphere such as South Sandwich Islands, Marion Island, Iles Crozet, and the Ross Sea Igneous Province, and were thus interpreted as derived from McDonald Island. Collerson, K. D., Regelous, M., Frankland, R., Wendt, J. I., Kiernan, K., and Wheller, G., 1998, 1997 eruption of McDonald Island (southern Indian Ocean): new trace element and Th-Sr-Pb-Nd isotopic constraints on Heard-McDonald Island magmatism. Abstr. 14th Aust. Geol. Convention, Townsville, July 1998. The following was provided by scientists aboard the international Ocean Drilling Program (ODP) Scientific Drilling Vessel JOIDES Resolution based on observations made during the Leg 183 Kerguelen Plateau/Broken Ridge cruise. On 13 January 1999, the ship passed within 10 km of Heard Island and 7.1 km of McDonald Island providing excellent views of the lower elevations of Heard Island except for partially obscured views of the Laurens Peninsula. No volcanic activity was evident on Heard Island. McDonald Island had continuing fumarolic activity, particularly between The Needles and Macaroni Hill, N of Samarang Hill. In this area volatiles were emitting from multiple point sources and the rock had a pale color. A "rubbly" flow or debris-fall deposit was observed in the valley extending N from the fumarole field to a few tens of meters above the shoreline. However, no lava fountains or red glows were seen. Similar fumarolic activity was reported in 1997 (BGVN 22:01) although volcanic activity at McDonald Island appears to be more widespread now. Two partially confined steaming-ground areas were observed on the N and NE flanks of the island. The easternmost of these features extends from a notch below Samarang Hill to sea level. A central finger of steaming ground appears to originate near the main fumarole field in a steep NW-oriented valley. At least two point sources, located high on the SW-facing cliffs S of Samarang Hill, are venting now; no activity has been reported previously on the southern part of the island. No activity was observed in the South Head area. Information Contacts: C. Leah Moore, Cooperative Research Center for Landscape Evolution & Mineral Exploration (CRC LEME), University of Canberra, ACT 2601 Australia (URL: http://crcleme.org.au/); Paul Wallace, Ocean Drilling Program (ODP), 1000 Discovery Drive, Texas A&M University, College Station, TX 77845-9547 USA (URL: http://www-odp.tamu.edu/). Observations of McDonald Island were made from aboard the vessel "RSV Aurora Australis" on 9 November 2000. These were the first documented observations of the volcano in several months. Atmospheric conditions were overcast but afforded good lateral visibility. Venting of volatiles was first sighted at a distance of 24 km from the island. Subsequent observations were made as close as 7 km offshore. Dispersed activity was visible at several points high on the flanks of the island. On the NE side, fumarolic activity was most pronounced at the top of a short steep gully extending below the apparent summit crater. Pulses of emission produced plumes 30-50 m high from this point every few minutes. Volatiles were also being emitted from several other points on the NW slopes, and at the N end of the island where they originated at the foot of rock bluffs near the top of the coastal slope and at another location on the slope at ~60 m elevation. There was no evidence of activity on the S portion of the island. The emissions observed during November 2000 were less pronounced than those described on 13 January 1999 (BGVN 24:01). They also appear to have been issuing from higher on the slopes than those observed on 18 March and 2 April 1997 (BGVN 23:02). The position of the most forceful emissions observed during November 2000 appeared identical to those first seen in March 1997. Significant emissions from the face below the crater at ~70 m elevation, and from two points at the head of an apron of dark-colored rubble a few hundred meters N of the gully extending from the summit crater, were also similar to those of 1997. Weak discharges that rose from the N edge of the apron were detectable to ~80 m elevation during November 2000, but were absent during March 1997. No steaming ground was observed below ~60-70 m elevation during November 2000, nor was there any evidence of fumarolic activity at sea level as had been cited during March 1997. Comparisons of color vertical air photographs taken in 1980 from 3,050 m, 1,650 m, and 980 m altitudes to oblique photographs taken from sea level aboard the "RSV Aurora Australis" on 18 March 1997 and 9 November 2000 (figure 5) indicate that the most significant changes to the morphology of the volcano occurred prior to the vessel's first visit. Some steep coastal slopes appeared to have been replaced by slopes of more moderate angle. A more jagged skyline of bare rock has replaced the relatively smooth, vegetated upper slopes that previously existed. Figure 5. General view of the NE coast of McDonald Island under hazy conditions on 9 November 2000. Photo by Graeme Snow (AAD), courtesy of Kevin Kiernan. Information Contacts: Suzanne Stallman, Gordon Bain, and Graeme Snow, Australian Antarctic Division (AAD), Channel Highway, Kingston, TAS 7050, Australia (URL: http://www.antarctica.gov.au/); Kevin Kiernan and Anne McConnell, Geography & Environmental Studies, University of Tasmania, GPO Box 252-79, Hobart TAS 7001, Australia. Accounts from ship-based observers and satellite imagery have revealed significant morphological changes to McDonald Island due to volcanic activity prior to 6 November 2001. A comparison of November 2001 satellite imagery with 1980 aerial photographs was described in AUSGEO News 68 (December 2002). Tourist reports were published in the Australian Antarctic Division's Antarctic Non-government Activity News (ANAN), no. 89 (January 2003). Geoscience Australia's National Mapping reports the elevation of McDonald Island as 230 m, but the activity described below has most likely increased this value. A photograph taken on 9 November 2000 (BGVN 26:02) was similar to previous photos and descriptions. In addition, thermal alerts for nearby Heard Island occurred frequently in November and December 2000, an indication not only of eruptive activity there, but clear weather during which any significant activity at McDonald would likely have been detected in infrared satellite imagery. Combined, these observations place the eruptive activity after 9 November 2000, and probably after 30 December 2000. Analysis of 6 November 2001 satellite imagery. A routine check of Australia's maritime boundaries in the Southern Ocean by Geoscience Australia showed that the McDonald Islands had doubled in size, and it appears that the separate islands of McDonald Island and Flat Island are now one. Geoscience Australia's Bill Hirst was comparing an aerial photograph of the McDonald Islands taken on 11 March 1980, with satellite imagery from Landsat 7 EGM data acquired on 6 November 2001, when he noticed that the islands had changed shape (figure 6). The islands earlier combined area of 1.13 km2 is now thought to have changed to 2.45 km2. Some features have disappeared. Figure 6. Aerial photograph of the McDonald Islands taken on 11 March 1980 from a helicopter (left) and satellite imagery from Landsat 7 EGM data acquired on 6 November 2001 (right). The outline of the islands in 1980 is superimposed on the satellite image. Courtesy of Geoscience Australia. The senior surveyor onshore during a 6-day visit in 1980 was Geoscience Australia's John Manning, who named many features of the McDonald Islands. He noted that "Thelander Point doesn't appear to be an appropriate name now, Williams Bay seems to be filled in, and The Needle may be gone . . . Windward Point is no longer a point because there are about 400 m of new land in front of it. The tumultuous bay I called Cauldron is now full of rock, and Flat Island is probably joined to McDonald Island by a shingle comprising gravel and pumice." Other new features appear to be a volcanic hill and a spit to the E of the island similar to one on Heard Island. Macaroni Hill was once the highest point. Observations in late November 2002. Experienced observers noted changes to the McDonald Island group in late November 2002 from on board the Akademic Shokalskiy, which was visiting the Heard Island region on a voyage organized by the New Zealand-based tour company Heritage Expeditions. A comparison of old and new photographs of the area shows that the N part of the island is much higher than before, and 75% of the land area that is now there may be completely new. During the last five years Australian national program vessels that have observed the McDonald group have reported seeing steam issuing from vents at various locations. Three of the passengers on the Akademic Shokalskiy had worked on Heard Island in the 1950's and 1960's, and one of them, Graham Budd, was one of the first two people to set foot on McDonald Island, in 1971. When the ship was travelling towards Heard Island en route from Crozet early on the morning of 26 November, Budd noticed the changed profile of the McDonald islands and expedition leader Rodney Russ decided to take a closer look after the end of the visit to Heard Island. It was not possible to sail too close to the islands because the water around them is uncharted. Under Australian management plans for McDonald Island, landings cannot be made there without a permit and only then for "compelling scientific reasons." 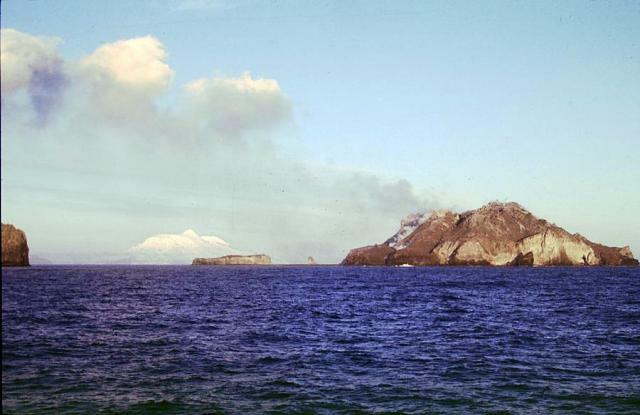 On the second sail past the island, passengers observed steaming slopes and "two types of lava dome." The highest part of the islands was now at the N end, not in the S at Maxwell Hill as it had been previously. Analysis of enlarged digital photographs taken by passengers indicates that considerable sedimentation has occurred along the coastline, such that the formerly separate Flat Island is now joined to the main island. It also appears that several meters of ash have blanketed the N half of McDonald Island, and Macaroni Hill at its N end has disappeared. A low-lying spit and reef now extend over 1 km E of McDonald Island. Although it is not certain when the activity occurred, wildlife did not appear to have been affected. Penguins were still nesting up to the top of Maxwell Hill and on ash-covered remnants of the old land inshore of the new spit. The birds appear to have deserted Flat Island. There were a large number of penguins and seals on the beaches, and several dozen fur seals swimming offshore. The two geologists on the voyage, Australian Jon Stephenson and New Zealander Margaret Bradshaw, believe that a scientific visit should be made so that the sequence of the new volcanic events and the composition of the lavas can be determined. The Australian national program currently plans to conduct a scientific program on Heard Island during the 2003-04 austral summer, but currently has no plans to do land-based research on McDonald Island. MODVOLC Thermal Alerts. Following the distribution of the above reports via the Volcano Listserv, David Rothery and Diego Coppola (The Open University) searched for "thermal alerts" at McDonald Island using the MODIS Thermal Alerts website (http://modis.higp.hawaii.edu/). This system is the first truly global high-temperature thermal monitoring system. It is capable of detecting and documenting changes in active lava flows, lav domes, lava lakes, strongly incandescent vents, and hot pyroclastic flows. No alert is likely to be triggered by an ash cloud. As described by Flynn et al. (2001) and Wright et al. (2002), the MODIS Thermal Alerts website provides a series of maps updated every 24 hours to show "thermal alerts" based on night-time (approximately 2230 local time) infrared data from a 1-km-resolution instrument called MODIS that is carried by NASA's Terra and Aqua satellites. Thermal alerts are based on an "alert ratio" (3.9 µm radiance - 12 µm radiance) / (3.9 µm radiance + 12 µm radiance), and an alert is triggered whenever this ratio has a value more positive than -0.8. This threshold value was chosen empirically by inspection of images containing known volcanic sites at high temperature, and is the most negative value that avoids numerous false alarms. There are also some daytime (approximately 1030 local time) alerts that are based on the same algorithm but incorporating a correction for estimated solar reflection and a more stringent threshold whereby the alert ratio is required to be more positive than -0.6 in order to trigger an alert. Thermal alert data are available for the region including McDonald Island from 13 May 2000 onwards (with a gap 26 May-2 June 2000). No thermal alert occurred at McDonald Island from 13 May 2000 through 30 January 2003. This null result does not prove that the activity must have occurred before 13 May 2000, because MODIS cannot see through cloud, which is common in that region. However, there were multiple thermal alerts for nearby Heard Island during the same period (24 May; 3, 5, and 6 June; 25 September; 29 October; 5, 15, 19, and 24 November; 16, 17, 26, and 30 December 2000; 2 February 2001). Had McDonald been active on the same dates, it is highly likely that this activity would have been detected at least once. Climate and Biology. The following is taken from the AUSGEO News report. The McDonald Islands are remote, and people have landed on the islands only twice since a British sealer sighted them in November 1833. The islands have cliff-lined coasts and are surrounded by rocky shoals and reefs that are treacherous for boats and landing parties. They lie in stormy seas where temperate water from the Indian Ocean meets icy Antarctic water. Most days are cloudy, making it very difficult to obtain satellite imagery and photographs of the islands. Maximum temperatures average 3°C, and wind gusts can reach 210 km/hour. Two Australian scientists looking for fur seals made the first landing in 1970, a 20-minute visit, by helicopter from the French Antarctic ship Gallieni. The second landing, in March 1980, was from the Cape Pillar, chartered by National Mapping to survey the Heard Island-Kerguelen region. The small shore party, which included a botanist, biologist, geologist, and surveyor, landed by helicopter and amphibious vehicle. They stayed ashore for six days while the ship sailed its survey lines. The McDonald Islands were designated a World Heritage site in December 1997 because of their pristine sub-Antarctic ecosystems and geological activity. Local waters are teaming with Patagonian toothfish, Mackerel icefish, Grey rockcod, and Unicorn icefish. Colonies of Macaroni and Gentoo penguins breed and feed from these islands. References. Flynn, L.P., Wright R., Garbeil, H., Harris, A.J.L., and Pilger, E., 2001, A global thermal alert system using MODIS: initial results from 2000-2001: Advances in Environmental Monitoring and Modelling, no. 3, Monitoring volcanic hotspots using thermal remote sensing, edited by Harris, A.J.L., Wooster, M.J. and Rothery, D. A. (Http://www.kcl.ac.uk/ kis/schools/hums/geog/advemm/vol1no3.html). Wright, R., Flynn, L., Garbeil, H., Harris, A., and Pilger, E., 2002, Automated volcanic eruption detection using MODIS: Remote Sensing of Environment, v. 82, p. 135-155. Information Contacts: Bruce Hull, Senior Environment Officer, Environmental Management & Audit Unit, Australian Antarctic Division, Environment Australia, Channel Highway, Kingston, Tasmania 7050, Australia (URL: http://www.antarctica.gov.au/environment); AUSGEO News and National Mapping, Geoscience Australia, GPO Box 378, Canberra, ACT 2601, Australia (URL: http://www.ga.gov.au/); David A. Rothery and Diego Coppola, Department of Earth Sciences, The Open University, Milton Keynes MK 6AA, United Kingdom. The first ever MODVOLC thermal anomaly at the McDonald Island volcano was detected on 14 November 2004. The anomaly, one pixel in size, was located directly over the island. There have been none since then through 13 January 2005, nor have there been any other obvious false-alert pixels in the vicinity, suggesting that this anomaly was genuine. Andrew Tupper investigated the above-mentioned anomaly (on a Terra MODIS image, overpass time 1827 UTC, 14 November 2004; seen in bands 20-25 (3.8-4.5 um)). Basically, the anomaly occurred within 2 km of the location of the summit coordinates given in the title above. Tupper went on to note: "I've looked at other MODIS images from around that time, and some recent AVHRR images, but it is extremely difficult to get a cloud-free shot of that area. There are no other hot spots visible, and no volcanic plumes visible, but unless there was a bonfire lit by a stranded party of toothfish poachers at the time, I can't think of any reason to doubt that the hot-spot is volcanic." Information Contacts: Matt Patrick, Luke Flynn, Harold Garbeil, Andy Harris, Eric Pilger, Glyn Williams-Jones, and Rob Wright, HIGP Thermal Alerts Team, Hawai'i Institute of Geophysics and Planetology (HIGP) / School of Ocean and Earth Science and Technology (SOEST), University of Hawai'i, 2525 Correa Road, Honolulu, HI 96822, USA (URL: http://modis.higp.hawaii.edu/); Andrew Tupper, Darwin Volcanic Ash Advisory Centre (VAAC), Commonwealth Bureau of Meteorology, Northern Territory Regional Office, PO Box 40050, Casuarina, NT 0811, Australia (URL: http://www.bom.gov.au/info/vaac/). The Global Volcanism Program has no synonyms or subfeatures listed for McDonald Islands. Historical eruptions have greatly modified the morphology of the McDonald Islands, located on the Kerguelen Plateau about 75 km W of Heard Island. The largest island, McDonald, is composed of a layered phonolitic tuff plateau cut by phonolitic dikes and lava domes. A possible nearby active submarine center was inferred from phonolitic pumice that washed up on Heard Island in 1992. Volcanic plumes were observed in December 1996 and January 1997 from McDonald Island. During March of 1997 the crew of a vessel that sailed near the island noted vigorous steaming from a vent on the N side of the island along with possible pyroclastic deposits and lava flows. A satellite image taken in November 2001 showed the island to have more than doubled in area since previous reported observations in November 2000. The high point of the island group had shifted to the McDonald's N end, which had merged with Flat Island. There is no Deformation History data available for McDonald Islands. There is no Emissions History data available for McDonald Islands. The Global Volcanism Program has no maps available for McDonald Islands. There are no samples for McDonald Islands in the Smithsonian's NMNH Department of Mineral Sciences Rock and Ore collection. Large Eruptions of McDonald Islands Information about large Quaternary eruptions (VEI >= 4) is cataloged in the Large Magnitude Explosive Volcanic Eruptions (LaMEVE) database of the Volcano Global Risk Identification and Analysis Project (VOGRIPA).